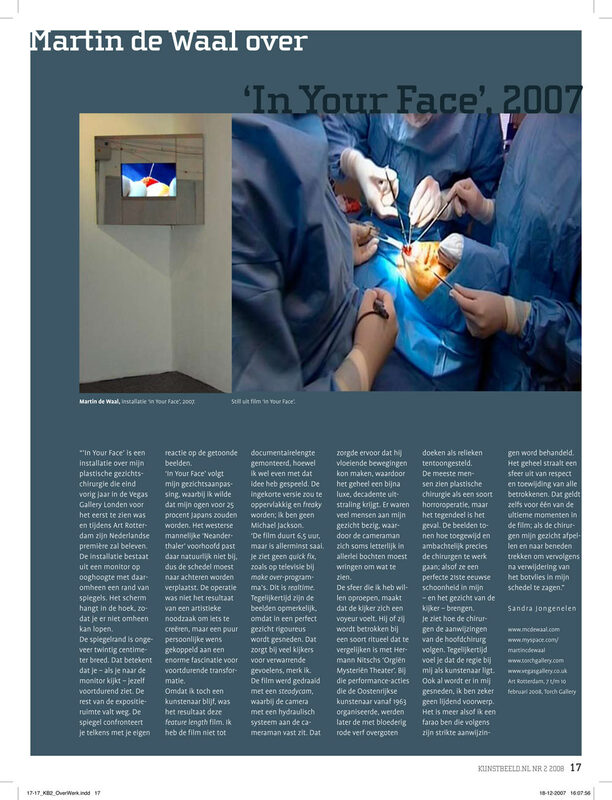 “In Your Face is an installation about my facial plastic surgery. It was first shown at the end of last year in the Vegas Gallery in London and will have its Dutch premiere at Art Rotterdam. The installation consists of a TV screen at eye level framed by mirror tiles. The screen hangs in the corner so you cannot walk around it. The mirror frame is about 20 centimeters wide which means if you look at the monitor, you are also constantly looking at yourself. The remainder of the exposition area fades away. The mirror confronts you with your own reaction to the images shown on the screen. “In Your Face tracks my facial adaptations. I wanted my eyes to become 25% Japanese. The western male Neanderthal forehead does not match that, so the skull had to be moved back a bit. The operation was not a result of an artistic need to create, but a pure personal desire coupled with a great fascination for continual transformation. “Since I am after all an artist, the result was this feature length film. I haven’t edited the film to a documentary length, although I played with the idea. Such an edited version would become too superficial and freaky. I’m no Michael Jackson. “The film lasts six and a half hours, but is at no moment boring. It’s not a quick fix like you see on make-over shows on TV. This is real time. At the same time, the images are notable because some rigorous cutting is being done on a perfect face. I’ve noticed that that creates emotional confusion in some viewers. “The film was made with a steady-cam whereby the camera was attached to the camera man with a hydraulic system. It was thus possible to create smoothly flowing movements which give the film a somewhat luxurious, decadent feel. There were several people working on my face simultaneously so the camera man had to literally wriggle in and out to be able to get the best views. “The feeling I wanted to give the viewer was that of voyeurism. He or she becomes a part of a sort of ritual comparable to Hermann Nitsch’s "Theatre of Orgies and Mysteries". In the performance actions that the Austrian artist began creating in 1963, he took the drapes which were covered in blood red paint and later displayed them as relics. “Most people see plastic surgery as a sort of horror operation, but the opposite is true. The images show the surgeons’ dedication and craftsmanship. It’s as if they are bringing a perfect 21st century beauty into my face, as well as the face of the viewer. You see how the surgeons follow the instructions of the chief surgeon. Yet, at the same time, you feel that the direction of the piece is in my hands as artist. Even though they’re cutting into my face, I’m certainly not a suffering object. It’s more like I’m a pharaoh who’s being treated according to his own strict orders.